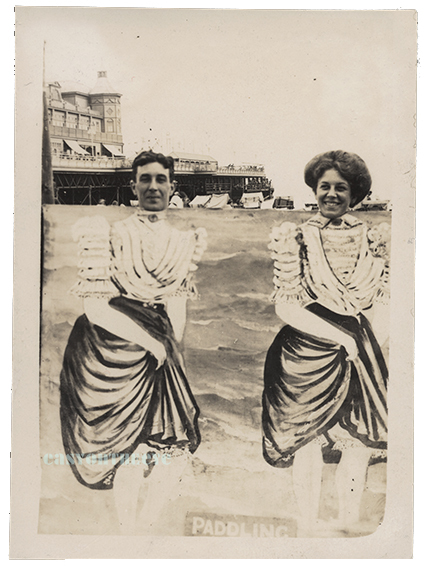 There can be few more familiar seaside souvenir photographs than those boards with holes in which you stick your heads through to have your picture taken while holidaying at the seaside or visiting a fair. The boards are painted with all sorts of crazy or surreal scenes, usually people’s bodies, and designed to look as incongruous as possible when a real head is plonked into the scene. The handful here are great examples. The image ‘in’ the car is obviously quite early, from a time when vehicles were still something of a novelty, I would guess pre-WW1. 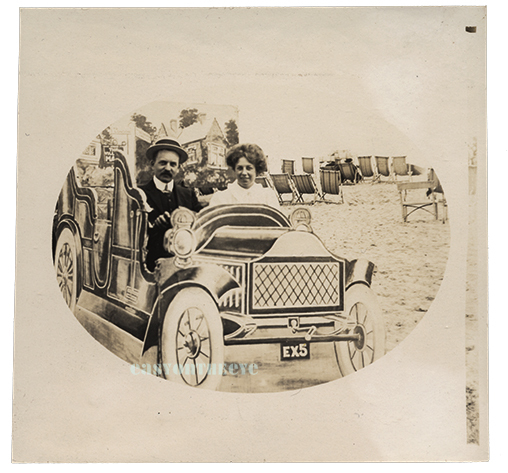 Later on, photographers actually drove real cars onto the beach for people to sit in. It’s quite a complicated set-up too. The painting is flat, the perspective part of the painting. Behind it is a bench to sit on, and a fake steering wheel. Then behind that is another flat painting of some scenery. Off to the right is the actual beach, complete with deckchairs. The oval frame has I assume been added in the darkroom, but it is a little off-centre so you can see the edge of the original negative on the right. The image titled ‘Paddling’ is from around the same time, as the woman on the left is clearly the same person from the car photo, though her male companion is different. This is a simpler flat painted board, with the heads just rested in cutouts on the top edge. The cross dressing result is what makes us smile. The effect is rather spoilt by having the pier in the background (which I haven’t been able to identify for certain) intrude. 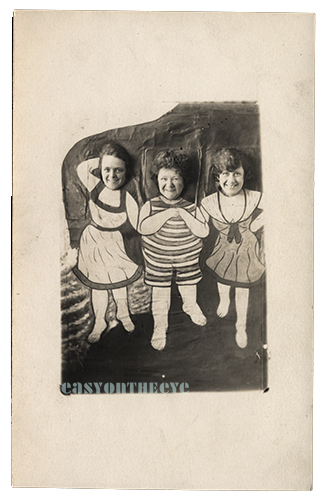 The three bathing ladies is a more comical effect, thanks to the short bodies painted onto the scenery. No date or location but likely to be 1920s. It’s a little hard to read the backdrop, it may be a canvas frame with reinforced openings for the head. Nor were Brits alone in finding this sort of image amusing. The fourth example is French, and the firm of Jacoby were in the trade for some years (quite why they should blame the Americans for the style of photo I’m not sure!) The guy as the baby is actually quite scary looking in this one, but then if you had a dad dressed in a frock with his hand up your legs you’d probably look worried as well. 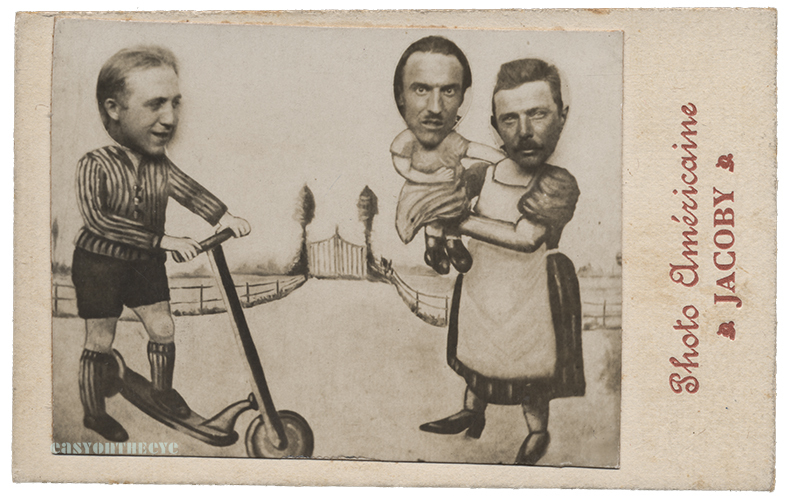 Jacoby printed out the photo then glued it to a printed backing card, a bit like a comic carte de visite. I’ve seen other Jacoby cards with aeroplanes and even Micky Mouse paintings being used. A lot of these cards are contemporary with the early walkies, suggesting perhaps that the latter eclipsed them before very long. The experience can still be had in a few seaside towns, there was a cut out board on the prom at Cleethorpes in 2013 with a cameraman standing by.